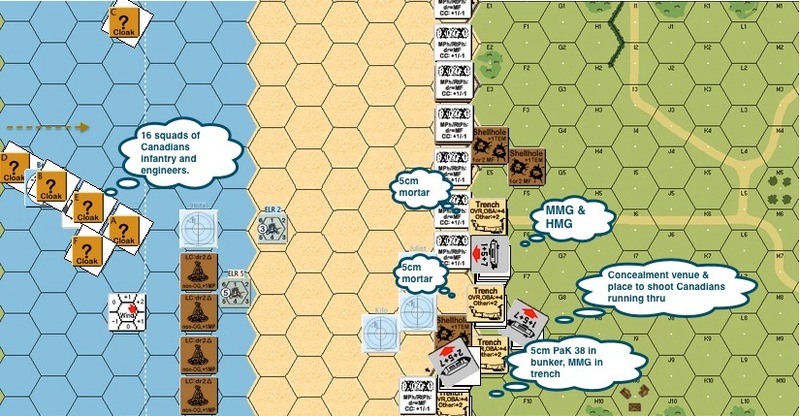 Posted on November 1, 2014 by Hong Kong Wargamer Tagged AARAdvanced Squad LeaderASLboard wargameHong KongNormandySeaborne AssaultVASL	CommentsNo Comments on AAR A79 Mike Red – Defense in Seaborne Assault! 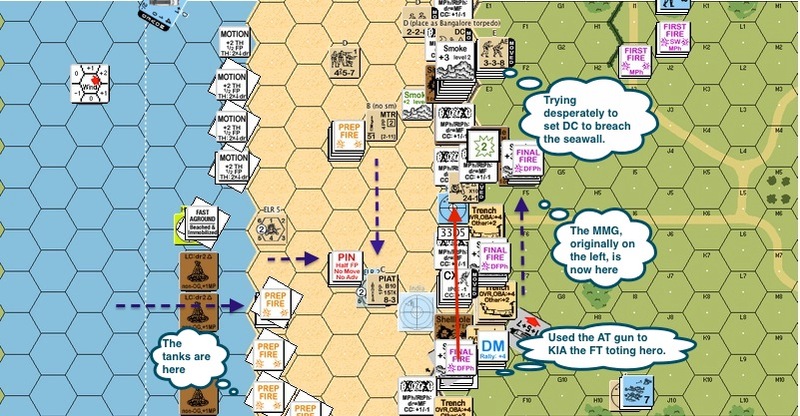 AAR A79 Mike Red – Defense in Seaborne Assault! 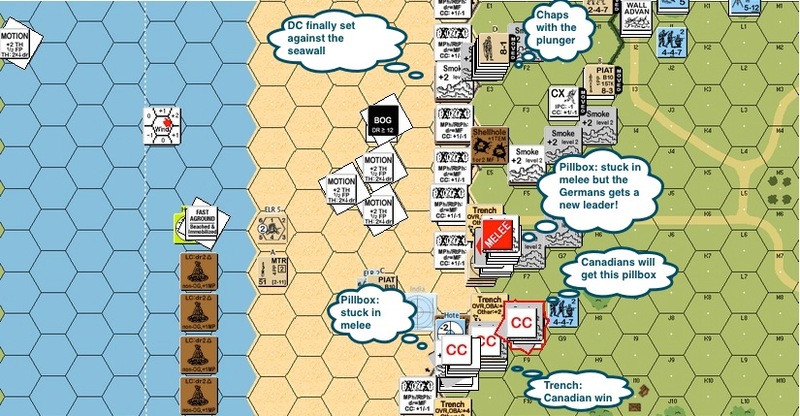 A79 Mike Red depicts the part of D-Day landings at Courseulles-sur-Mer, the most heavily fortified position – “Mike Red” – that the Anglo-Canadian forces had to face on Juno Beach. A total of 16 Canadian squads bore down on 5 second line German squads and 6 gun crews. 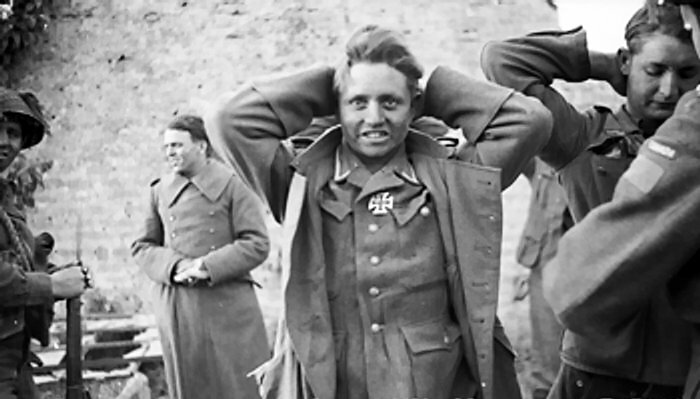 The crews, with their 8 morale and self rallying ability, were the backbone to the whole German defence. The Canadians win by clearing all pillboxes of good order Germans and by exiting 7 VPs of personnel in 7 turns. The defence layout you see is actually created by my opponent. The tetrahedrons discourage landing crafts from unloading directly in front of the pillboxes. The antitank gun in the leftmost pillbox and the medium machine gun in the trench next to it covered most of the beach. The pillbox in the center housed a heavy and a medium machine gun, accompanied by an 8-1 leader. The approach to the pillbox was covered by mortars on both sides. Behind the row of wires, there was a seawall that ran all along the edge of the hinterland. The singular pillbox that pointed inland was for rallying and for concealment generation, apart from being a great position from which to shoot any Canadians who broke through. 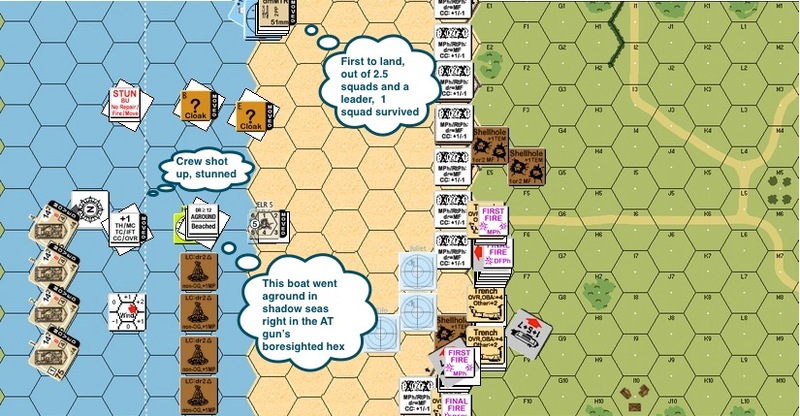 Canadian Turn 2 : The first Canadian boat beached. Two and a half squads hit the sand with their gear. 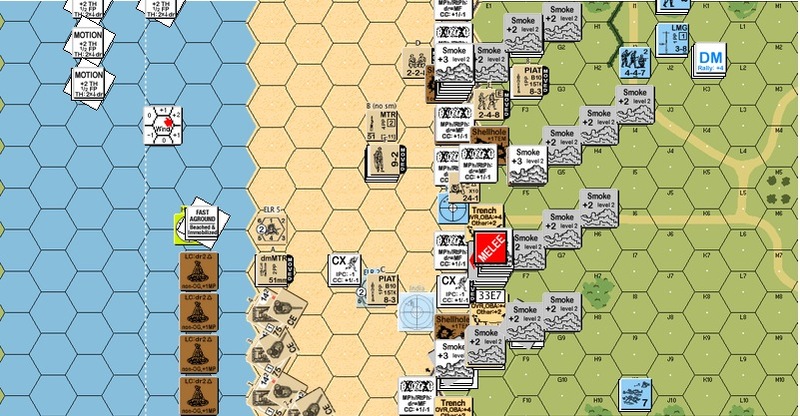 They were promptly shot up by the German defenders and only 1 squad survived (note : infantry doing seaborne assaults are Fanatic on beaches, but they Casualty Reduce instead of Break). The survivors did their best to pick up the mortar and the PIAT in the meantime. The other boats kept coming in. One of the landing crafts went aground precisely where the German AT gun was bore-sighted. It was a scary moment for those involved but the Germans kept firing armour piecing shells instead of high explosive shells which were a lot more effective against landing crafts. Someone must had gotten the shells and the boxes switched! German Turn 2 : The Germans figured this was a good time to shift their people to the right flank. The reinforcement arrived as well and positioned itself as a the “back stop” to possible breaches. A team of gun crew started moving the left most medium machine gun into the pillbox so as to cover more of the beach against the incoming Canadians. Their ability to reposition quickly was really a tribute to the top quality machine gun designs the Germans had, which made them more portable than their opponent’s MMGs. 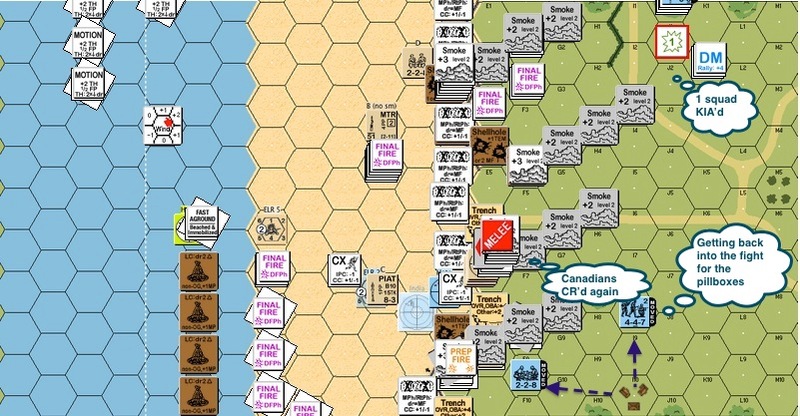 Canadian Turn 3 : The Canadian mortars were very successful in getting off smoke shells in key places. More Canadians hit the beach. At this stage of the landing, the Canadians lost 5.5 squads, 1 crew and 3 leaders! The bright spot here was that a hero stepped up from amongst the ranks and appeared to have picked up a flamethrower .. The German antitank gun got their ammo figured out at last. 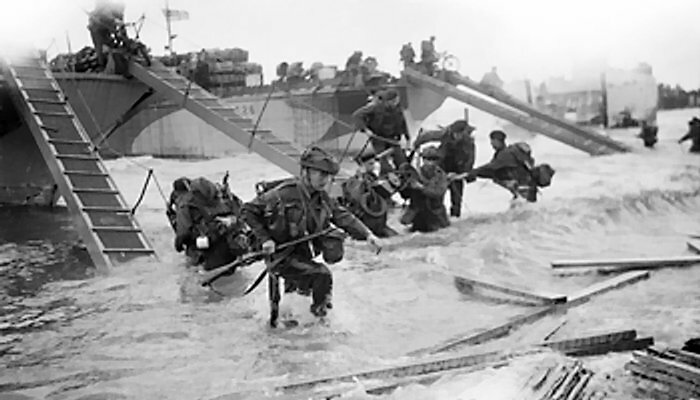 However in most cases the Germans waited for the landing infantry to step onto the sand before opening fire. 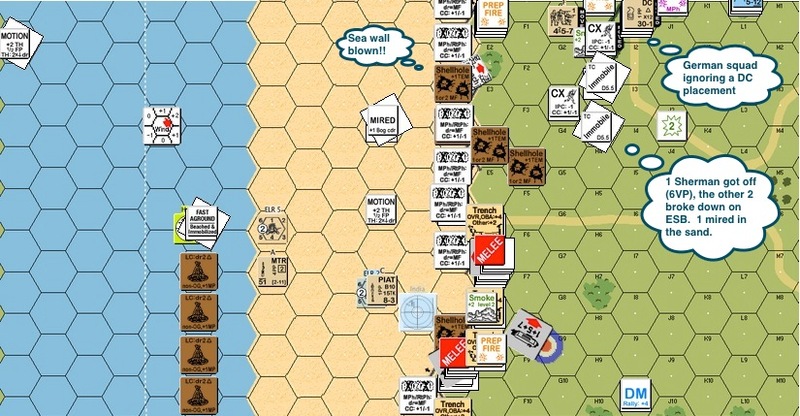 Canadian Turn 5 : The Canadians tried very hard to set a demolition pack against the seawall. Luck was simply not with them that day. The Germans had already positioned their medium machine from the left flank to one of the shell holes on the right so as to cover any breaches. You can’t see this too well but the Shermans fired off a few smoke shells already. The flamethrower wielding hero took advantage of the smoke cover, ran across the beach and got ready to roast up the center pillbox, only to be KIA’d by the antitank gun! Canadian Turn 5 (contd) : There was a mild breeze that day and hence the smoke drift. Canadian Turn 5 (contd) : This is the same view as the one above but with the smoke (mostly) deleted. 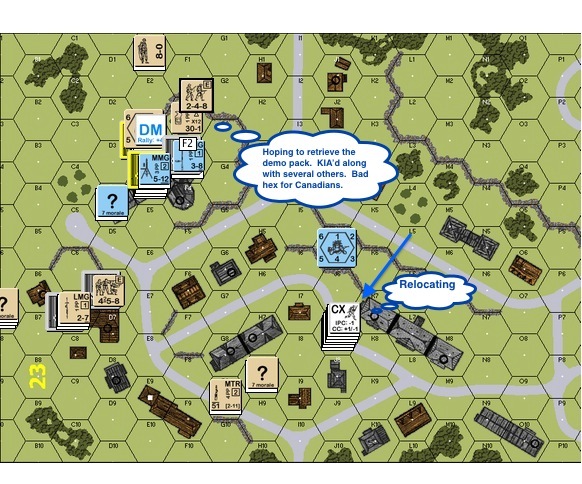 What I meant to say in the diagram was that the Canadians got casualty reduced (“CR’d” not “DR’d”) in close combat. 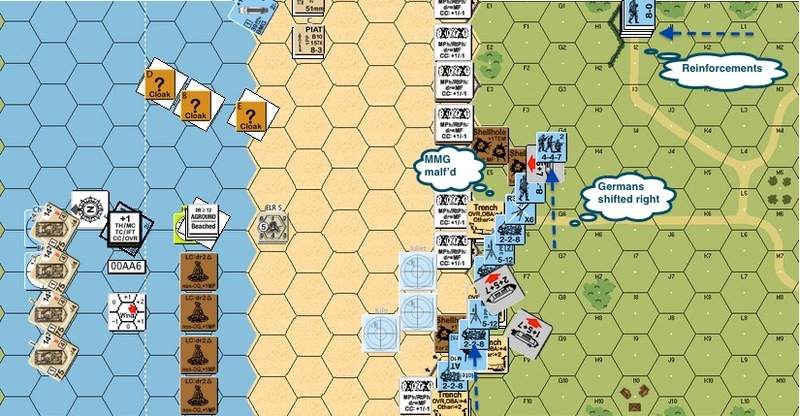 Taking advantage of the drifting smoke, the MMG crew voluntarily broke and ran towards the right flank, getting itself positioned to hinder the Canadians from exiting. German Turn 5 : Some of the German troops went back to the pillboxes on the left flank. The Canadians need to clear the pillboxes AND to exit 7 VPs off the board, so keeping the melee going would be an important element to the German plans. The MMG crew on the right flank (top of the map) couldn’t rally though. The Germans did what they could to move some folks in and if necessary, grab the machine gun! The Canadians were not doing well with the melee at all, they got casualty reduced again! Canadian Turn 6 : The Canadians finally managed to set demolition charges against the seawall, now they need to get away from the wall to blow it. The Canadians flung themselves onto the pillboxes in this round. They would win a couple of the close combats but they would continue fight it out at pillbox locations. The center pillbox might be the most frustrating, not only did it yield no German casualties in face of steady Canadian losses, it now sprung a new German leader! As per my usual practise, I promptly named this rising star after my opponent. The Shermans moved across the beach in anticipation of a successful breach in the seawall. 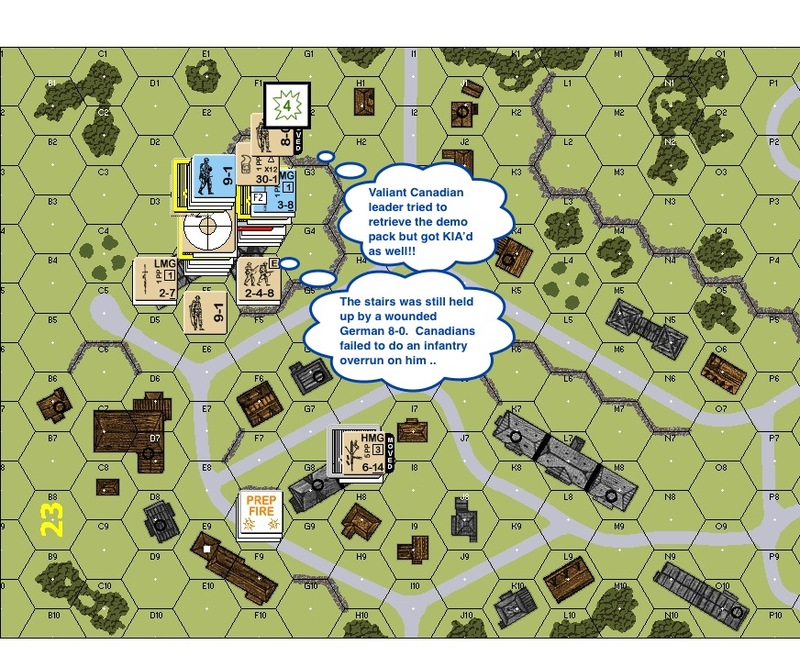 The Canadian infantry had little chance exiting the board at this stage, but getting two Sherman’s off would make this a Canadian game, provided they were successful with the pillbox melees as well. One of the Shermans bogged. 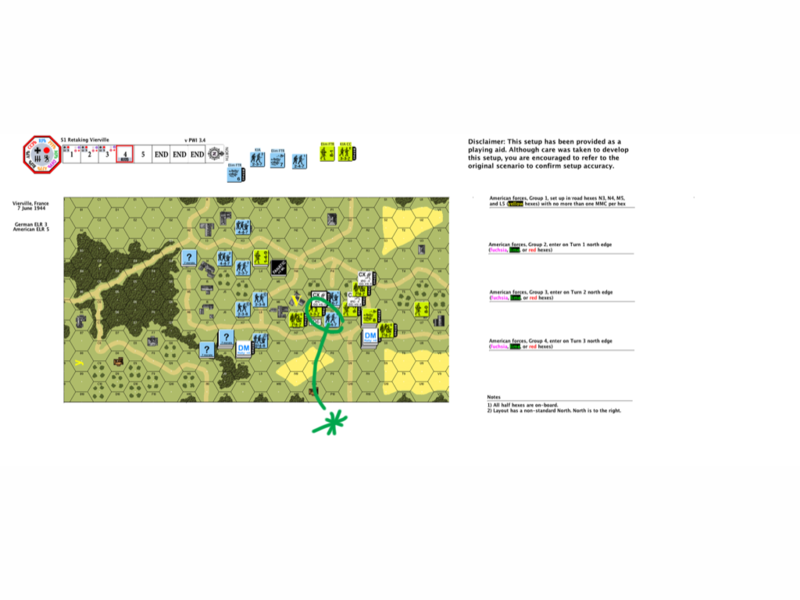 German Turn 6 : The Germans on the top right of the map managed to join up with the MMG crew. The notable move from my opponent here was that he voluntarily broke the Canadian squad that held the detonator switch to the set DC which allowed a leader to rout with them as well. The leader would then grab the switch from the brokers in the coming rally phase. Canadian Turn 7 : My opponent’s enterprising leader grabbed the detonator switch as planned and breached the sea wall. The Shermans started up and drove inland. The first one rolled for “excessive speed breakdown” and got off the board. The first 6 VPs! The Canadians only need one other Sherman to get off. The next Sherman drove across the breach and rolled for ESB. It went too fast and was immobilized. Okay, there’s still a last one. 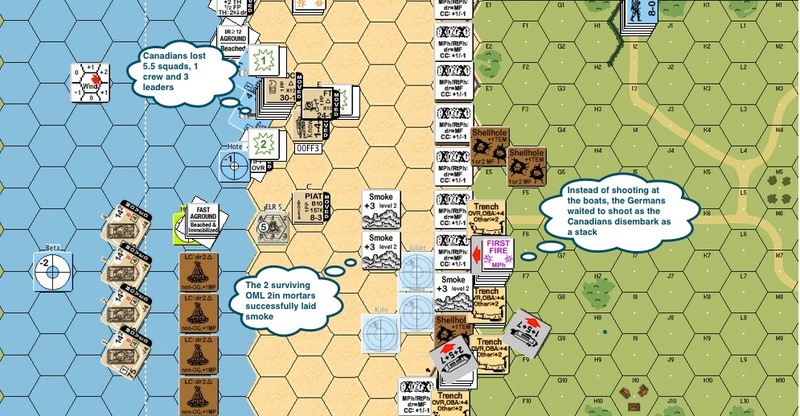 All the Canadians need was 7VPs off the board, after which it’s up to the melees. The last one got onto the hinterland, clanked forward steadily ..
.. and broke down as well. 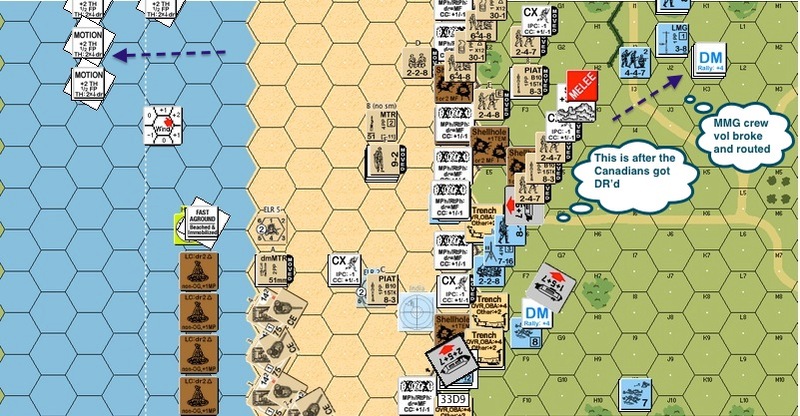 This is a Normandy scenario, dated 6 June 1944, D-Day. The 4th Commando Brigade moved towards Langrune-sur-Mer and into elements of a Panzer division. They radioed the French Canadians nearby for help and they joined the fight on Turn 4. On the far north (left on-screen) of this board is a big patch of woods. As you move towards the south it’s vast tracts of open ground with little patches of grain and orchards. There’s a village on the south (right) with a lot of rowhouses and stone walls. The commandos setup on the left at the edge of the woods. The Germans setup in the village. The commandos are assault engineers and so they get smoke grenades at 4 or less. They get some demolition charges and a 51” mortar. The French Canadians bring in a couple more mortars and heavy machine guns later on, also from the north. The Germans get a heavy machine gun, a medium machine gun and a few light machine guns plus a 50” mortar. The Germans have 3 fortified hexes in 3 different stone buildings. The Commonwealth wins immediately when they control 2 or more buildings that contain fortified hexes. Takezo played the Germans while I played the Commonwealth. 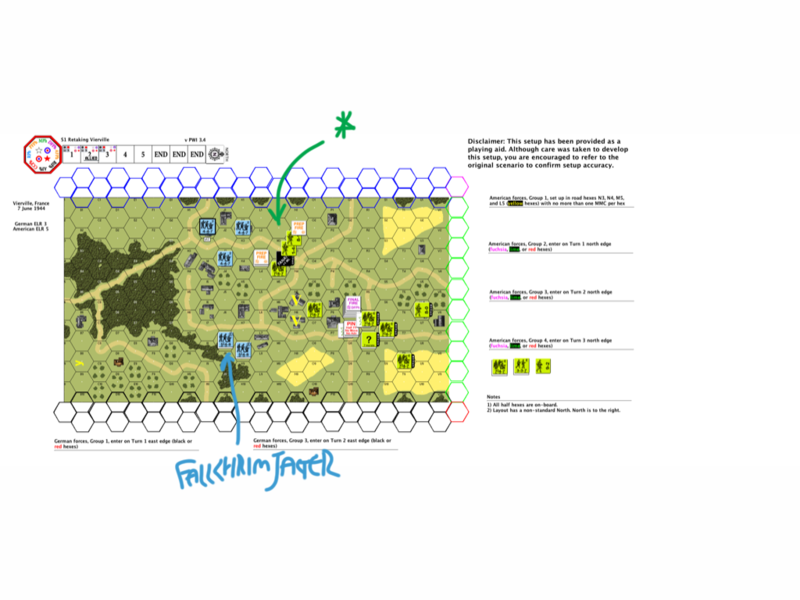 This is Allied Turn 1 : the commandos started making the trek over the divide. The mortar fired off a smoke round down the road where the German HMG pointed at. I hoped to feint a left (east) and head right (west) when the French Canadians show up on Turn 4. I made the mistake of putting the mortar too far back though. Later on in the game it was unable to support the push. Allied Turn 2 : My hero rushed up with a demolition charge to draw some fire away from his brothers. He got than that. He ran into a hidden German half squad in the woods and got shot by the Germans holed up in the buildings from the middle of the board. The British sniper was very active as well, hitting the same stack of Germans at the top of the map multiple times! Allied Turn 4 and the French Canadians arrived at the scene. There were a number of German MG and a mortar (in that roundabout) to content with, hence the entry was crowded and disorganised. The commandos threw smoke grenades to cover their approach the best they could. The British mortar was embarrassingly out-of-place. By this time it was quite clear that the schwerpunkt was coming from the right (bottom). 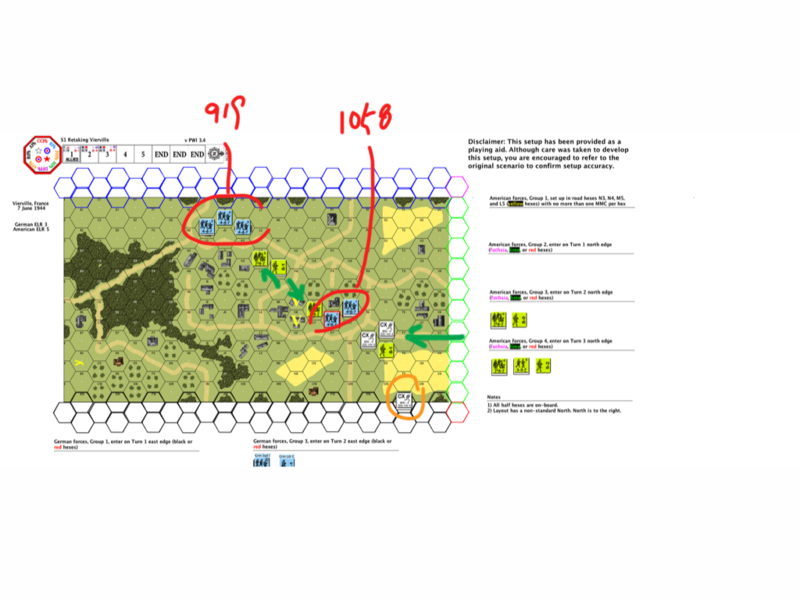 Axis Turn 5 : the Germans were moving back and to the west (bottom). The lead Commonwealth troops moved fast enough to harassing the retreating Germans. Allied Turn 7: there was a bit of drama with the Germans holed up on level 1 of a stone building. Earlier shots pushed them towards being fanatic. Rounds after rounds of fire couldn’t touch them. The French Canadians figured they would give it a last try with a feeble little 50″ mortar. Guess what? They rolled snake eyes and got a critical hit!! The crowd went wild (to the extend PBeM could..). As the dice gods would have it : they then rolled boxcars for the IFC resolution …. I swore I heard my British counters groan from their boxes. The Commonwealth troops, close behind the retreating Germans, moved to have them encircled. Allied Turn 8 DFPh and I was out of time : Tazeko revealed where the Fortified hexes were after the last Allied Movement Phase. The Commonwealth troops would end up advancing into 1 out of 3 of the fortified buildings as opposed to the 2 required by the victory conditions. For those of you who played this before, you are right, there’s a slight mistake here. The 3 fortified hexes should be in 3 different stone buildings. Oh well, a game is a game! move forward more aggressively, seek to push the boundaries and set the tempo as opposed to having the tempo dictated to by the defence. have the mortars move up together with the troops. Any thoughts and/or advice, please comment! On June 7 1944, one day after the Normandy landings. the 101st Airborne (“Screaming Eagles”) was sorting themselves out from all over the Cotentin Peninsula and was tasked with securing the eastern approach to the American landing at Utah beach. Vierville-sur-Mer was a major traffic thoroughfare. 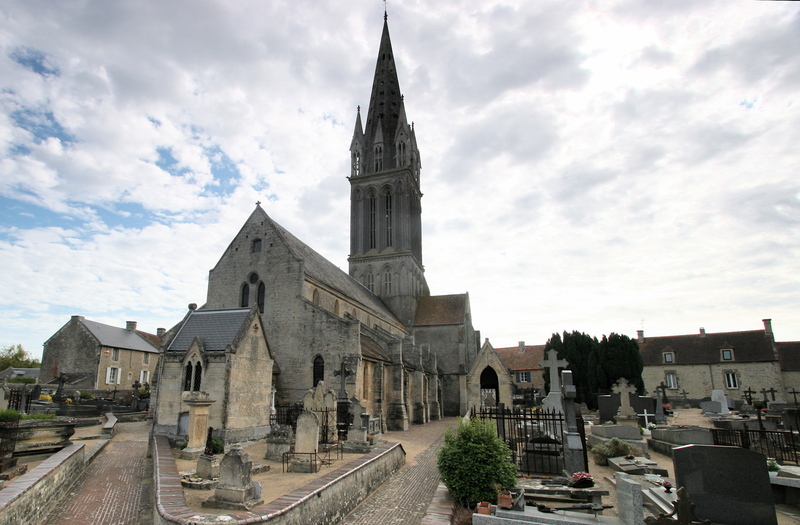 Although the Americans secured it earlier they had to moved westwards towards the German strongpoint of St. Come du Mont (see Mission Albany). There are three groups of symbols in this map of Normandy. The one on the top left is Utah Beach, the one on the bottom left is St. Come du Mont which was a German stronghold. The group to the right is Omaha beach and a bit inland from Omaha Beach is Vierville-Sur-Mer. An assortment of German units took the opportunity to deliver a counterattack and among them, the elite 6th Fallschirmjäger Regiment. This day would see an all out brawl at Vierville-sur-Mer, paratroopers to paratroopers. Erwin plays the Germans and I the Americans. 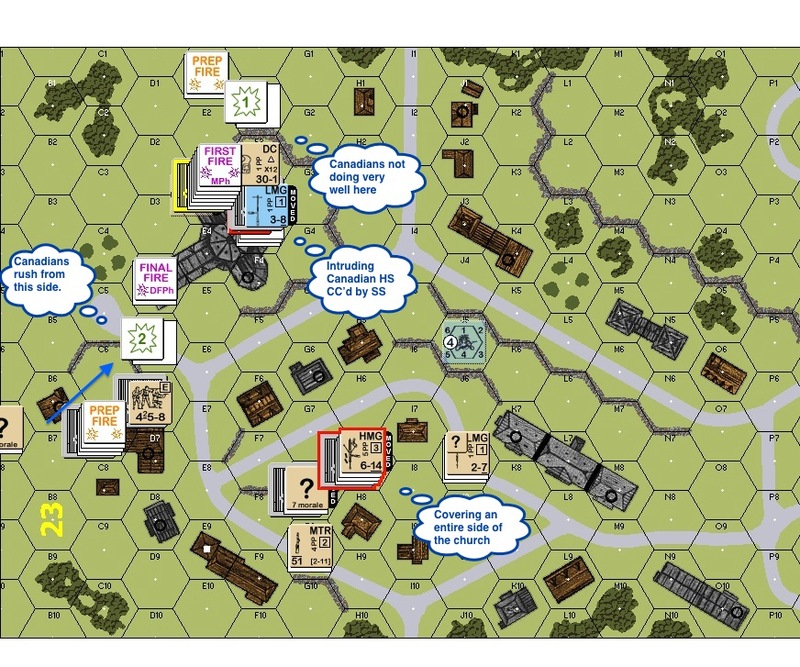 We decided to play this Advanced Squad Leader Starter Kit Scenario with full Advanced Squad Leader rules. 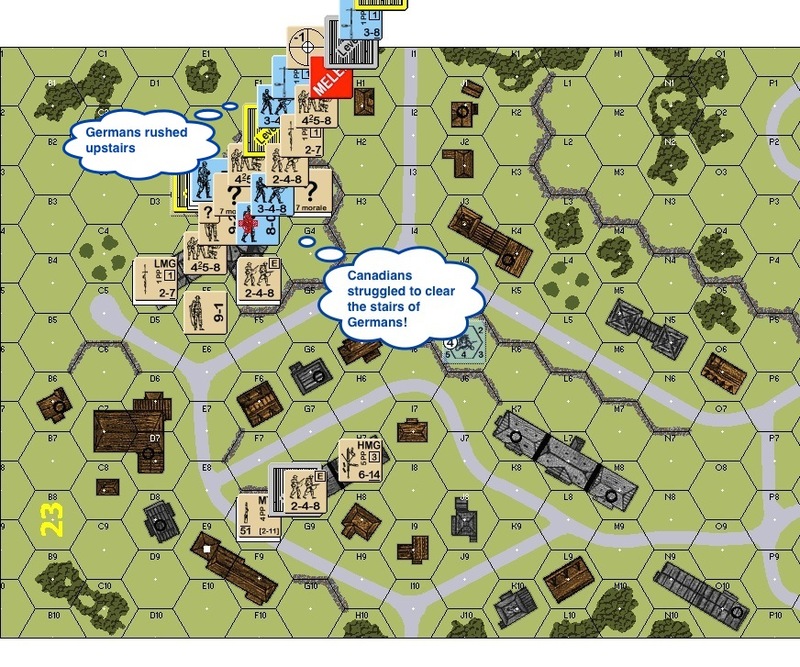 The Americans win if there are no “good order” German units in the four buildings marked with “V”s on the map. 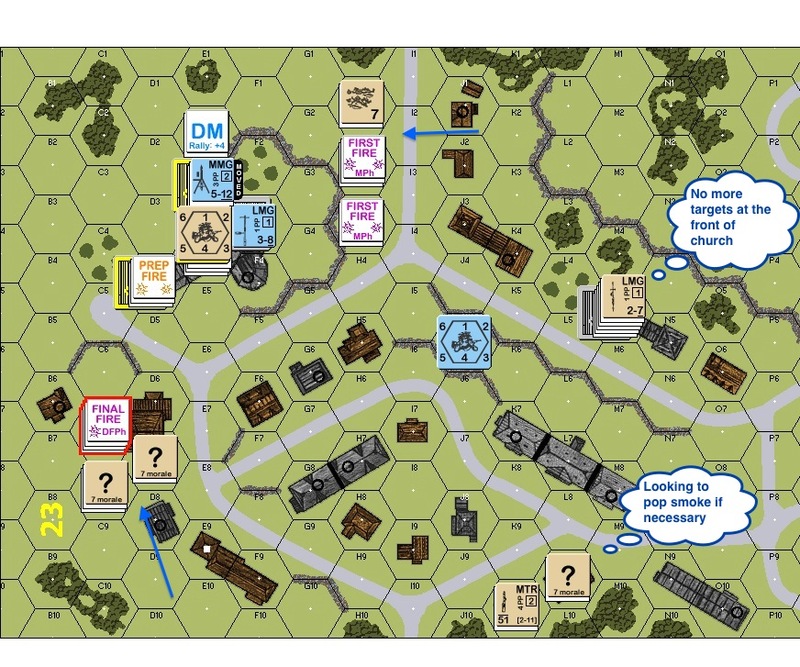 By the same token, the Germans need to keep a “good order” unit in at least one of the four buildings at game end (notice the Americans have the last move). The Americans went straight to work. Two full squads and the 8-1 leader went to the key buildings in the southwest, the other elements went to the northeast to meet up immediately with the 1058th Grenadiers. The southwest element could potentially be isolated and might find itself fighting a much tougher battle until reinforcements arrive. Their mission was to play for time. The northeast element was to clear the way for the reinforcements and were free to play to their strength in the attack. Other American elements started to arrive. They used the grain field (which is in season) to make it across the open ground, using a building for cover. A potential danger was that new German elements might appear behind them and cut them off from their rout paths. So one squad stayed behind in the woods as the rear guard (circled in orange on the map above). The 919th Grenadiers crossed the street in the south-west and pressured the squads on that corner of the intersection. At the same time the 6th Fallshirmjäger moved to slice the battlefield in half, isolating the 8-1 and his little group. To the north (right edge of the map), the Screaming Eagles couldn’t break through the 1058th Grenadiers. 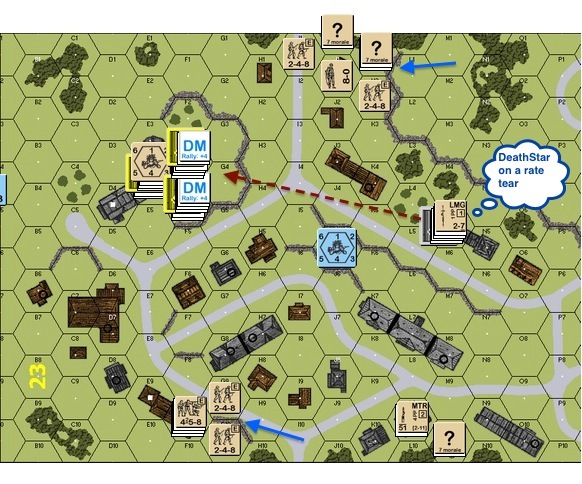 They needed to clear a way to town fast ‘cause the key buildings are falling to the Fallshirmjäger soon, which also means they and their arriving brothers would all be standing outside the grain field with no protection if they couldn’t get into town. 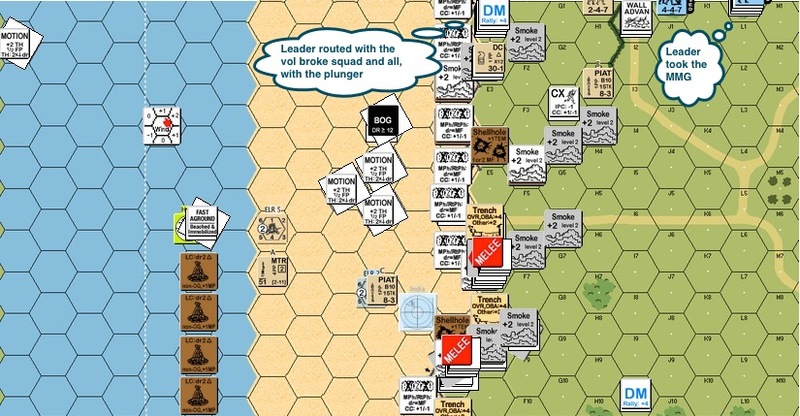 The Screaming Eagles managed to get into close combat in the north. 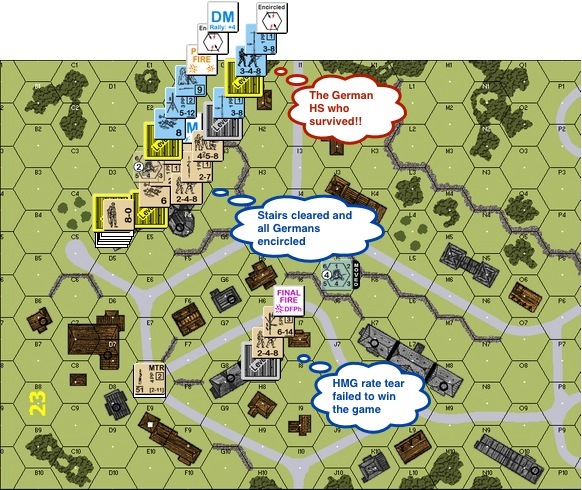 A half squad was killed when they went in for hand to hand with a German squad and their 8-1 leader. On the other side of the block an American half squad ambushed their German counterpart when they broke into their building. The Americans slipped through to the other side and met up with the American paratroopers that were holding the Fallshirmjägers at bay. However the American’s hold on the key junction was strained as they endured volleys after volleys of German fire. So here we are at the start of Turn 4 in a 5 turn scenario. Will the Germans succeed in capture at least one of the buildings at the intersection and hold off American attacks?